Pioneer Place is a fantastic, intimate space for theatre, as well as concerts, weddings and all your private events. With flexible floor seating and a capacity for 188 seats, Pioneer Place is great location for any event! Rows A – D are rows of conference room chairs on the floor. They are the seats most often removed for dance floors, extended stages, or table seating. This is also our most easily accessed seats for those wishing for handicapped accessible seating. Row E is on a riser – level with the stage, so you see over the heads of those in rows A-D. There is a bit more leg room than on the floor, and seats 1-12 have arms on the chairs. Rows G-N are not in a traditional balcony, as labeled, but do start about 7 steps off the ground and it is a tiered bank of movie theatre seats, complete with cup holders. 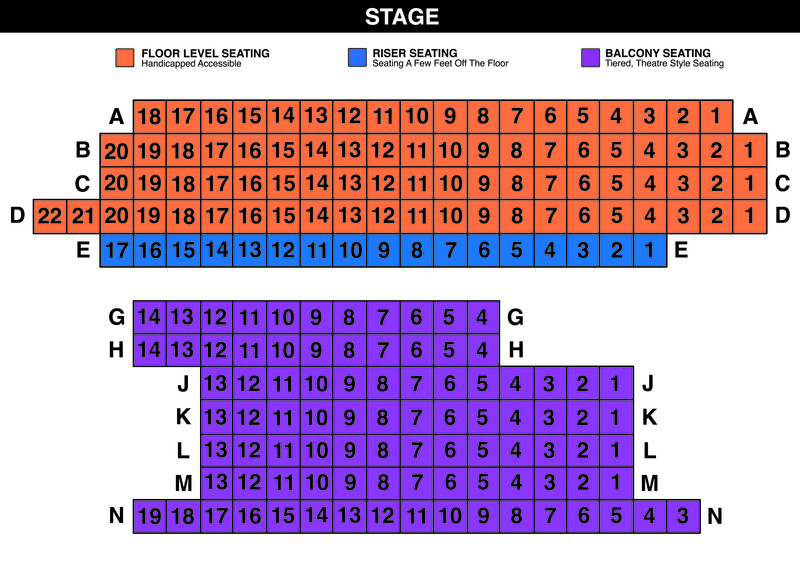 Below you will find a small representation of our seating area – please click on the photo for a larger seating chart. 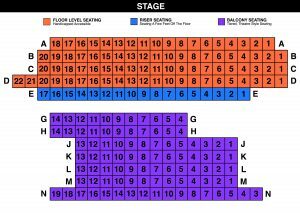 Please be aware the stage is shown at the TOP of the seating chart. It is our goal at Pioneer Place on Fifth Theatre to make your ticketing experience as convenient as possible. You may order tickets on-line to any Pioneer Place Theatre Company show, or any concert event. Box Office Hours: Monday-Friday from 10am – 4:00pm, and starting 1 hour before any show. Daytime Box Office: Pioneer Place on Fifth Theatre basement, 22 Fifth Avenue South, St. Cloud, MN 56301. Please enter the building through the side door located in the alley between the Theater and Greek Cravings, and go downstairs. Pioneer Place on Fifth Theatre does NOT mail out any tickets. Any Will-Call tickets will be held at the Box Office for you to pick up. If you chose the Print-At-Home option, the tickets were sent to your e-mail within your receipt and should be printed out and brought with you to the performance. Single tickets can be purchased to any event in advance either by ordering online, via phone, or in person. Tickets can be picked up anytime the box office is open up until showtime the day of the show. All ticket reservations with a total exceeding $50 require payment in advance. We reserve the right to release any tickets not claimed or paid for as of 15 minutes prior to show time. Tickets can be exchanged to another performance of the same production, subject to availability,or a gift card equal to total purchase price may be given when the box office is notified at least 48 hours before a show. All unclaimed will-call tickets at show time will be rushed to waiting lists or at-door sales. *All orders for theater shows will appear on your credit card statement as Pioneer Place. *All orders for Concerts will appear on your credit card statement as Veranda Lounge Entertainment. The house will open for seating one half hour prior to the scheduled event time. No flash photography allowed for any event. Drinks from the Veranda or the concessions are welcome in the theatre. Food from the Veranda is not allowed in the theatre. Cellular phones and pagers must be turned off or to silent inside the theater. Your attendance at this event shall be deemed as your consent to have your image or likeness appear in any live or recorded video display or other reproduction in whole or in part of the event. ANYONE entering the theatre must have a ticket, including infants. We discourage attendance by children under the age of six (6) years, unless the show is geared for a younger audience. Parents will be asked to remove disruptive children from the show. Pioneer Place Theatre is a non-profit organization funded, in part, by charitable contributions and your patronage.